Blender, Boxcutters, Jigger, Skewers, Stirrer (long Spoon), Sour Glass. In Blender with ice, Blend all ingredients, except the Clove of Pineapple and Cherries. 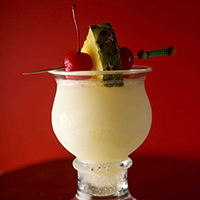 Pour into Sour Glass, create a skewer with Pineapple and Cherries, served.